1Department of Agronomy, University of Agriculture, Faisalabad 38040, Pakistan; 2Department of Biological Sciences, Pakistan Institute of Engineering and Applied Sciences, Islamabad 45650, Pakistan; 3Department of Agronomy, University College of Agriculture, University of Sargodha, Sargodha 40100, Pakistan. Abstract | Besides being a costly input considerable losses of chemical fertilizers occur that add to environmental pollution and reduced nutrient use efficiency. However, plant growth promoting rhizobacteria (PGPR) are cheap and excellent alternate and can be applied as seed inoculation to enhance nutrient use efficiency along with reduced nutrient losses. A field experiment was conducted to evaluate the effect of seed inoculation viz. control (no treatment), Rhizobium japonicum (nitrogen fixing bacteria) and Pseudomonas fluorescens (phosphorus solubilizing bacteria) on growth, allometric traits and dry matter yield of different soybean genotypes viz. EBR4V4, Freedom and Swat-84. Seed inoculation significantly improved the total chlorophyll content, leaf area index, leaf area duration, crop growth rate and dry matter yield. Seed inoculation with P. fluorescens produced more pronounced results for all the studied traits as compared to R. japonicum. The tested genotypes of soybean did not differ for allometric traits and dry matter yield; however, EBR4V4 produced the tallest plants. In conclusion, seed inoculation of soybean improved the growth, allometric traits and dry matter yield of soybean, and could be employed for the betterment of crop productivity. Citation | Zohaib, A., S. Yousaf, S.A. Anjum, T. Tabassum, T. Abbas, W. Muzaffar and W. Ikram. 2019. Growth, allometry and dry matter yield of soybean genotypes in response to seed inoculation with plant growth promoting rhizobacteria. 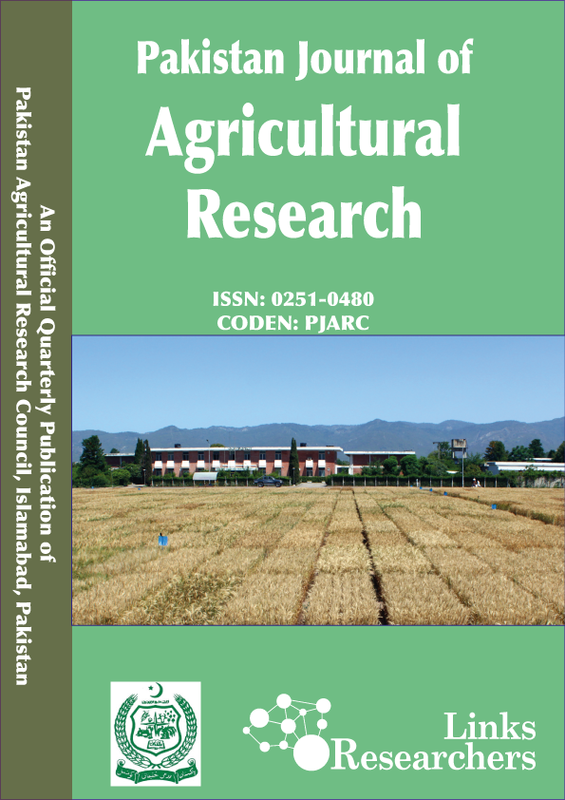 Pakistan Journal of Agricultural Research, 32(1): 102-109. Soybean is an important oil seed crop of world having 19% cholesterol free oil and 42% good quality protein (Wilcox and Shibles, 2001). It also has superior amino acid profile compared to other sources of plant protein and is an important source of biodiesel fuel (Graham and Vance, 2003). However, more often plant nutrition affects the seed production and quality, and protein and oil productivity as well (Zohaib et al., 2018a, b). Being a leguminous crop, soybean has the ability to fix atmospheric nitrogen. The roots of soybean are occupied by Rhizobium bacteria, which form nodules and fix atmospheric nitrogen (Abbasi et al., 2013). Nitrogen is an essential macronutrient required for all plants’ growth and development (Frink et al., 1999). It has been established that nitrogen fixing bacteria (NFB) present in soil are not enough and thus their efficacy in biological nitrogen fixation is decreased. Therefore, to enhance the Rhizobium population in root zone, seed inoculation of soybean with a suitable Rhizobium strain is necessary. Thakur and Panwar (1995) reported an increase in plant height, leaf area and dry matter accumulation by seed inoculation of mungbean with Rhizobium. Similarly, an increase in plant height and biological yield of soybean (Malik et al., 2006) and chickpea (Togay et al., 2008) was observed by seed inoculation with Rhizobium. Phosphorus is an important macronutrient, required in relatively large amount for plant growth and development, productivity and nodulation of legumes (Pacovsky et al., 1986; Murtaza et al., 2014). However, the efficacy of phosphatic fertilizers is reduced due to phosphorus fixation in soil which causes a reduction in phosphorus availability and lessens the efficacy of phosphatic fertilizers (Jodie and Peter, 2000). Some bacterial species are known to solubilize the insoluble phosphorus in soil. These phosphorus solubilizing bacteria (PSB) also release some plant growth promoting hormones, enhance nitrogen fixation (Richardson, 2001) and promote plant growth. Inoculation with a proper strain of PSB improves the availability of phosphorus and enhances growth and productivity of crops (Ponmurugan and Gopi, 2006). Rudresh et al. (2004) reported an increase in plant height, nodulation, number of branches per plant, nutrient uptake and total biomass of chickpea by inoculation with PSB. The chlorophyll content of soybean was increased by seed inoculation with NFB and PSB (Zarei et al., 2011). A differential behavior exists among different genotypes of same species regarding growth and productivity (Ali et al., 2004). Ngalamu et al. (2013) reported a significant difference among different genotypes of soybean pertaining to plant height, number of branches, number of pods per plant, number of seeds per pod, 1000-grain weight and seed yield. Therefore, to get better crop productivity and enhanced economic returns selection of genotypes which respond well to the applied inputs pertaining to growth, dry matter production and crop productivity is a pre-requisite (Kamal et al., 2015, 2016; Argaw and Muleta, 2018). It has been observed that the efficacy of bacterial strains for nodulation and N fixation differs with bacterial strain and host genotype which affects the growth and yield of crops (Aguilar et al. 1998; Farid and Navabi, 2015). Moreover, different rhizobial strains differ in their ability to survive and fix N with different genotypes and soil environments (Argaw and Muleta, 2018). Similarly, PSB also differ in their performance depending upon the host genotype (Tagore et al., 2013). Thus it is necessary to determine the suitability of different growth promoting bacteria in interaction with genotypes. Plant growth promoting rhizobacteria improve the growth and productivity of crop plants. However, the knowledge regarding comparative effectiveness of different PGPRs in improving the performance of different genotypes of soybean is lacking. The present study was conducted with the objectives to determine the effect of seed inoculation with NFB (Rhizobium japonicum) or PSB (Pseudomonas fluorescens) on growth, allometric traits and dry matter yield of soybean genotypes. A field experiment was conducted to assess the influence of seed inoculation with PGPRs on growth, allometric traits and dry matter yield of different genotypes of soybean at Agronomic Research Area, University of Agriculture, Faisalabad, during February-June, 2013. Seed inoculation treatments i.e. control (no treatment), NFB (Rhizobium japonicum) and PSB (Pseudomonas fluorescens) and different genotypes i.e. EBR4V4, Freedom and Swat-84 were included in the experiment. The experiment was carried out on sandy-silt soil having 8.2 pH, 0.92% organic matter, 0.41% total nitrogen, 5.25 ppm available phosphorus and 130 ppm available potassium. The experiment was laid out in randomized complete block design in factorial arrangement with three replications and net plot size of 5.0 m × 2.4 m. Sowing was done using hand drill maintaining 30 cm inter row spacing and 10 cm intra row plant spacing with seed rate of 100 kg ha-1. Fertilizer was applied at the rate of 25 kg N, 50 kg P2O5 and 50 kg K2O ha-1 at the time of sowing using urea (46% N), diammonium phosphate (18% N; 46% P2O5) and sulfate of potash (50% K2O) as sources. In all six irrigations were applied during the whole period of experiment. Inter row plant spacing of 10 cm was maintained by thinning of crop done 30 days after crop emergence. Weeds were kept below economic threshold level by three manual hoeing. Crop was harvested manually. The weather data prevailing during the study period is presented in Table 1.
where LAI1 and LAI2 are leaf area indices recorded at times t1 and t2, respectively. Where; W1 and W2 are dry weights at ﬁrst and second harvests taken at times t1 and t2, respectively. Where; A663 and A645 are absorbance of extract at 663 nm and 645 nm, respectively. Fisher’s analysis of variance technique was used to analyze the collected data and treatment’s means were compared using Tukey’s honest significance difference (HSD) test at 5% probability level (Steel et al., 1997). Table 1: Meteorological data prevailing during soybean growing seasons of field experiment. Source: Agro-meteorology Cell, Department of Crop Physiology, University of Agriculture, Faisalabad, Pakistan. There was a significant difference among different genotypes for plant height of soybean. Maximum plant height was produced by EBR4V4 (36.70 cm), which was statistically similar with Freedom (34.53 cm). However, seed inoculation, and interaction of genotypes and seed inoculation posed no significant effect on plant height of soybean (Table 2). The difference in plant height among different genotypes is attributed to differential genetic potential of different genotypes for plant growth and development. Similar results were observed by Ngalamu et al. (2013) who reported a significant difference in plant height of soybean among different genotypes. In present study, the seed inoculation surprisingly did not affect the plant height (Table 2). This might be due to enhanced utilization of improved nutrient status due to PGPRs for photosynthesizing plant parts as it is evident from improved chlorophyll content and LAI (Table 2) and synthesis of photo-assimilates which ultimately led to enhanced dry matter yield (Table 3). However, contrary to our present study previous studies showed a significant improvement in plant height by seed inoculation with PGPRs on chickpea (Tagore et al., 2013) and soybean (Lamptey et al., 2014). Table 2: Influence of seed inoculation on plant height, total chlorophyll content and leaf area index of different genotypes of soybean. Any two means in a column not sharing a letter in common differ significantly at p ≤ 0.05; NS: Non-significant; DAS: Days after sowing. content of soybean by the influence of seed inoculation. Total chlorophyll content was improved by the influence of seed inoculation of soybean as compared to control. Maximum total leaf chlorophyll content was produced by the influence of P. fluorescens (6.71 mg g-1 fresh weight), which was statistically similar with R. japonicum (6.49 mg g-1 fresh weight). The interactive effect of genotypes and seed inoculation on total chlorophyll content of soybean was not significantly different (Table 2). The tested genotypes did not differ in total chlorophyll content by the influence of seed inoculation which might be due to similar response of all genotypes to enhanced nutrient availability in biosynthesizing photosynthetic pigments (Adjei-Nsiah et al., 2018). In present study, the increase in total chlorophyll content by seed inoculation with NFB or PSB may be attributed to increased biological nitrogen fixation which might have enhanced the N availability to plants. As the nitrogen is structural part of chlorophyll, the enhanced N might have increased the total chlorophyll content. Similar results were reported by Bejandi et al. (2012) who observed an increase in total chlorophyll content by seed inoculation of chick pea with Rhizobium. Patra et al. (2013) found that seed inoculation with PSB and Azotobacter enhanced the total chlorophyll content in sunflower. Table 3: Influence of seed inoculation on leaf area duration, crop growth rate and dry matter yield of different genotypes of soybean. at 90 DAS (Table 2). A non-significant difference among different genotypes of soybean was observed regarding LAD at all the growth stages. The effect of seed inoculation on LAD was non-significant at 45-60 DAS; however, significant at 60-75 and 75-90 DAS. The LAD was increased by seed inoculation and highest LAD was observed by seed inoculation with P. fluorescens (44.38 and 52.92 days at 60-75 and 75-90 DAS, respectively). The interactive effect of genotypes and seed inoculation on LAD of soybean was non-significant at all growth stages (Table 3). Crop growth rate of soybean did not differ significantly among different genotypes of soybean. Seed inoculation of soybean posed significant effect on CGR at all the growth stages. Highest CGR was found by the influence of seed inoculation with P. fluorescens (7.77, 12.35 and 10.35 at 45-60, 60-75 and 75-90 DAS, respectively). The interactive effect of genotypes and seed inoculation on CGR of soybean was non-significant at all growth stages (Table 3). The genotypes did not differ regarding LAD (Table 3) which might be due to non-significant difference in LAI (Table 2). Similarly, CGR (Table 3) did not differ among genotypes and it is attributed to non-significant difference in chlorophyll synthesis (Table 2) and dry matter accumulation of soybean (Table 3). Initially the LAI was increased and then at latter growth stage viz. 75-90 DAS decreased. This is associated with enhanced leaf senescence at later growth stage with increased maturity. Increase in LAI by seed inoculation may be attributed to enhanced nitrogen and phosphorus nutrients availability to the soybean crop that resulted in increase in leaf area and ultimately LAI. Similar to our results Ali et al. (2004) reported that LAI of chick pea was increased by seed inoculation with Rhizobium than untreated control. In present study, increase in LAD (Table 3) due to seed inoculation is attributed to improved LAI of the crop (Table 2). Similar results were observed by Umale et al. (2002) who reported an increase in LAD by seed inoculation of soybean with P. fluorescens. Moreover, in present study, the CGR was increased at initial growth stages, however, decreased at later growth stages. However, plants which had seed inoculation treatment had greater CGR than untreated plants at each growth stage. The improved CGR by seed inoculation might be due to enhanced photosynthetic activity because of enhanced chlorophyll content and LAI (Table 2) which in turn might be the result of improved crop nutrition. Our results are supported by Sharifi (2012) who observed enhanced CGR by seed inoculation of safflower. The genotypes of soybean did not differ significantly among each other in dry matter yield of soybean. However, the effect of seed inoculation on dry matter yield was significant. Highest dry matter yield was produced by the influence of seed inoculation of soybean with P. fluorescens (9045.9 kg ha-1). The interactive effect of genotypes and seed inoculation on dry matter accumulation was found non-significant (Table 3). The genotypes did not differ in dry matter yield across seed inoculation treatments which might be attributed to non-significant difference in total chlorophyll content (Table 2), LAI (Table 2), LAD (Table 3) and CGR (Table 3). In present study, increase in dry matter yield by seed inoculation may be due to enhanced photosynthetic rate because of increased availability of nitrogen and phosphorus. Our results are supported by Yadegari et al. (2008) who observed an increase in total dry matter yield in common bean by the influence of seed inoculation with P. fluorescens. Similarly, Farias et al. (2016) reported improved dry matter accumulation in cowpea by rhizobial seed inoculation. Seed inoculation with PGPRs enhanced the growth and dry matter yield of soybean while P. fluorescens was most effective in this regard. It is concluded that seed inoculation with PGPRs is an effective approach in enhancing the growth and dry matter yield of soybean and may be used for the betterment of crop productivity. Ali Zohaib performed SPSS data analysis, prepared the write up and did overall management of article. Saima Yousaf conceived the idea, conducted experiment and collected data. Shakeel Ahmad Anjum supervised the study and gave technical input at every step. Tahira Tabassum collected literature and reviewed the write up. Tasawer Abbas helped in discussion. Wardah Muzaffar helped in data collection while Wasiq Ikram contributed in conclusion. Abbasi, A., D. Jafari and R.S. Sharifi. 2013. Nitrogen rates effects and seed inoculation with Rhizobium legominosarum and plant growth promoting rhizobacteria (PGPR) on yield and total dry matter of Chickpea (Cicer arietinum L.). Tech. J. Engin. Appl. Sci. 3(23): 3275-3280. Aguilar, O.M., M.V. López, P.M. Riccillo, R.A. González, M. Pagano, D.H. Grasso, A. Pühler and G. Favelukes. 1998. Prevalence of the Rhizobium etli-like allele in genes coding for 16S rRNA among the indigenous rhizobial populations found associated with wild beans from the Southern Andes in Argentina. Appl. Environ. Microbiol. 64(9): 2524-3520.
phosphorus application on growth and yield of chickpea (Cicer arientinum). Int. J. Agric. Biol. 6(1): 110-112. Bejandi, T.K., R.S. Sharifii, M. Sedghi and A. Namvar. 2012. Effects of plant density, Rhizobium inoculation and microelements on nodulation, chlorophyll content and yield of chickpea (Cicer arietinum L.). Ann. Biol. Res. 3: 951-958. Hunt, R. 1978. Plant Growth Analysis. Edward Arnold, London. pp: 37. Jodie, N.H. and B.N. Peter. 2000. Selection of phosphate solubilizers for use as biofertilizers. 8th international symposium on nitrogen fixation with non-legumes. December 3-7, 2000. (Eds.) Ivan Kennedy and Les Copeland. Univ. Sydney Aust. pp: 115. Kamal, M.A., F. Rasool, A. Zohaib, K. Ahmed and M. Nawaz. 2015. Growth response of rice hybrids to different levels of NPK. Int. J. Mod. Agri. 4(3): 52-56. Kamal, M.A., F. Rasool, A. Zohaib, K. Ahmed, T. Abbas, T. Rasool and M. Nawaz. 2016. Effect of NPK application at various levels on yield and quality of two rice hybrids. Sci. J. S. Sci. 4(1): 14-19. Lamptey, S., B.D.K. Ahiabor, S. Yeboah and D. Osei. 2014. Eﬀect of Rhizobium inoculants and reproductive growth stages on shoot biomass and yield f soybean (Glycine max (L.) Merril). J. Agric. Sci. 6(5): 44-54. Malik, M.A., M.A. Cheema and H.Z. Khan. 2006. Growth and yield response of soybean (Glycine max L.) to seed inoculation and varying phosphorus levels. J. Agric. Res. 44(1): 47-53. Murtaza, G., Ehsanullah, A. Zohaib, S. Hussain, T. Rasool, H. Shehzad. 2014. The influence of Rhizobium seed inoculation and different levels of phosphorus application on growth, yield and quality of mashbean (Vigra mungo L.). Int. J. Mod. Agric. 3(3): 92-96. Patra, P., B.K. Pati, G.K. Ghosh, S.S. Mura and A. Saha. 2013. Effect of biofertilizers and sulphur on growth, yield and oil content of hybrid sunflower (Helianthus annuus L.) in a typical lateritic soil. Sci. Rep. 2: 1-5. Richardson, A.E. 2001. Prospect for using soil microorganisms to improve the acquisition of phosphorus by plants. Aust. J. Plant Physiol. 28(9): 897-907. Sharifi, R.S. 2012. Effects of nitrogen rates and seed inoculation with plant growth promoting rhizobacteria (PGPR) on grain yield and some growth indices in safflower (Carthamus tinctories L.). Int. J. Agric. Crop Sci. 4: 949-954. Steel, R.G.D., J.H. Torrie and D.A. Dickey. 1997. Principles and Procedures of Statistics: A Biometrical Approach. 3rd ed. McGraw Hill Book Co. Inc., New York. USA. pp. 400-428. Thakur, A.K. and J.D.S. Panwar. 1995. Effect of Rhizobium VAM interactions on growth and yield in mungbean (Vigna radiata L.) under field conditions. Ind. J. Plant Physiol. 38: 62-65. Togay, N., Y. Togay, K.M. Cimrin and M. Turan. 2008. Effect of Rhizobium inoculation, sulfur and phosphorus application on yield, yield components and nutrient uptake in chick pea (Cicer arietinum L.). Afr. J. Biotech. 7(6): 776-782. Umale, S.M., V.R. Thosar, A.B. Chirey and A.N. Chimote. 2002. Growth response of soybean to P solubilizing bacteria and phosphorus levels. J. Soils Crops 12(2): 258-261. Zarei, I., E.M. Khan, G. Mohammadi and S. Petropouolos. 2011. Assessment of growth and yield components following the application of different biological fertilizers on soybean (Glycine max L.) cultivation. Aust. J. Crop Sci. 5(13): 1776-1783.